Cassandra's Legacy: But what's the REAL energy return of photovoltaic energy? But what's the REAL energy return of photovoltaic energy? 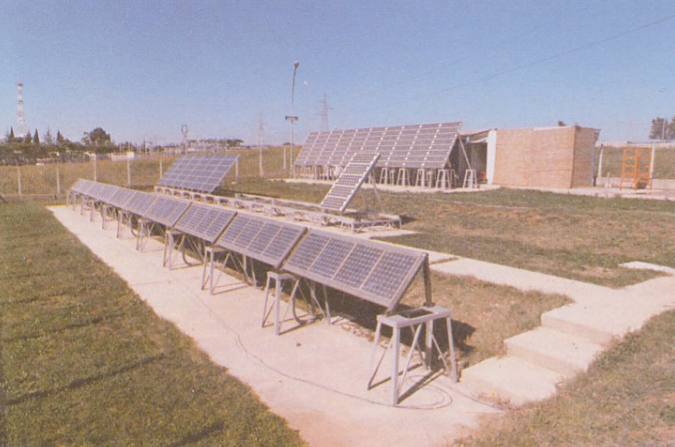 Some time ago, a colleague of mine told me the story of when he had been in charge of the installation of one of the first photovoltaic plants in Italy, in 1984 (shown in the figure, on the right). He told me that, shortly after the installation, a high-ranking politician came to visit the plant. As a demonstration, my colleague connected the plant output to an electric heater, lighting up the internal heating elements. The politician refused to believe that the heater was being powered by the PV plant. "There has to be a trick," he said, "this is not possible. It must be a scam." My colleague tried to describe to him how PV cells work, but imagine trying to explain quantum mechanics to a politician! Apparently, he left still unconvinced. Indeed, most of the current discussions on photovoltaic energy seem to turn around one or another kind of legend. The most recent one seems to be that photovoltaics has a low energy return (EROI or EROEI), sometimes said to be even smaller than one. If it were true, it would mean that photovoltaic plants are not producing energy, they are just consuming it! But it is not true. It is just one more example of confirmation bias: cherry-picking the data that confirm one's pre-conceived ideas. It is true that you can find a few studies (very few) that look serious (perhaps) and that maintain that PV has a low EROI. However, in a recent study, Bhandari et al. (1)⁠ surveyed 231 articles on photovoltaic technologies, finding that, under average Southern European irradiation, the mean EROI of the most common PV technology (polycrystalline Si) is about 11-12. Other technologies (e.g. CdTe) were found to have even better EROIs. Maybe these values are still lower than those of some fossil fuels, but surely not much lower (if they are lower) and a far cry from the legend of the "EROI smaller than one" that's making the rounds on the Web. Then, if you are worried about another common legend, the one that says that PV cells degrade rapidly, think that those of the plant described at the beginning of this article were found to be still working after 30 years of operation, having lost just about 10% of their initial efficiency! In addition, consider that the most common kind of cells use only common elements of the earth's crust: silicon and aluminum (and a little silver, but that's not essential). What more can you ask from a technology that's efficient, sustainable, and long lasting? All that doesn't mean that a world powered by renewable energy will come for free. On the contrary, it will take a very large financial effort if we want to create it before it is too late to avoid a climate disaster (quantitative calculations here). But a better world is possible if we really want it. (1) Bhandari, Khagendra P., Jennifer M. Collier, Randy J. Ellingson, and Defne S. Apul. 2015. 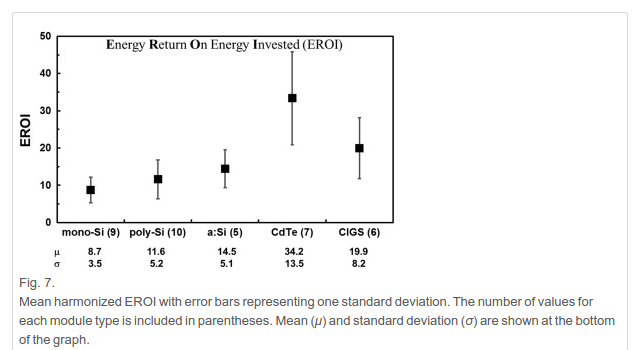 “Energy Payback Time (EPBT) and Energy Return on Energy Invested (EROI) of Solar Photovoltaic Systems: A Systematic Review and Meta-Analysis.” Renewable and Sustainable Energy Reviews 47 (July): 133–41. doi:10.1016/j.rser.2015.02.057. The result is EROEI of 2:1 over 25 years time. It comes to the conclusion that only 1/3 is production of the PV cells. And that makes sense if you consider all the energy needed to produce concrete, steel etc to the foundations. The main problem with renewable energy calculations is that not all the energy input needed is accounted for. A change into renewable will take decades, under this time we will loose much of the cheap oil that is needed for the changeover. This is a not fair study. EROEI was never be calculated including factors like "Electrical Network/Power lines restructuring"
"Security and Surveillance", "Network Stabilization Associated Costs (Combined Cycles)"..etc, etc. Why? Because it hasn't direct price to energy translation that it was exactly that Prieto & Hall do. into the input energy ecuation of EROEI, we always give under 1 (and non-sense) factor. conversion factor) into a completely different source of energy. For example... what energy consume a security system? It's the same in fossil or PV system? and translated it into the monetary cost of a service that it could be implemented in different ways. must share the energy output with the people that own the land. Human own thing, not energy related. This way of EROEI calculation will drop every energy source, but it's little realistic. In any case, a lot of data are 2008-2010 based. EROEI is always changing. It's not a fixed value. If we accepted this calculatino as valid, the text would shown us that we should work in other areas where the energy is supposedly lost without notice. Instead, the text seems a excuse to act against PV while the calculations add a lot of costs not linked with the PV itself but a specific way of deployment or temporal situations. "The result is EROEI of 2:1 over 25 years time. It comes to the conclusion that only 1/3 is production of the PV cells. And that makes sense if you consider all the energy needed to produce concrete, steel etc to the foundations." OK, so how does this compare to the other sources? Do we include remediation for coal strip mining projects, healthcare costs for anything dirty in the air, political costs for nuke plants, or whatever else isn't currently being included? There's a reason why many of the EROI arguments are a joke. If the cells only degrade 10% over 30 years (or even somewhat worse, assuming that's a best case scenario) doesn't that mean that any estimate of EROI is an underestimate because one could simply keep the cells in operation for twice as long and get, say, 80% more EROI? FYI, typical English usage would be "What more can you ask from ..." rather than "What can you ask more from ..." Technically the latter isn't *wrong* but it causes a reader to stumble. Yes, it is a point that someone made: I can't find the link again, but the concept was that PV cells are like hydroelectric dams; they can last for a long, long time and keep producing; that makes the EROEI very high. The problem is that we don't have time to squeeze all the possible juice out of 60 years old cells. We need to replace everything within 30-40 years or so! And thanks for the correction. Applied! Everything, really? Some people arguing for low EROEI of PV plants, for example, argue with the concrete foundations and other such investments, but I'd think that these things should last longer - you'd simply install new equipment in the same place. What happens to the EROI when we account for the storage and grid improvements needed to deal with the inherent variability of wind and PV? Referring to your previous post, most Americans will assume that ". . . a society not too different from ours . . ." means one where they can continue to summon concentrated flows of energy at will, no intermittency. An society based on an intermittent supply is not so different than the present one. Intermittent supply is a question of "demand management" and you are used to intermittent supply every time you wait for a bus. A very different society would be one in which you have no bus, but you can only ride your donkey. If you have one. Americans, by and large, don't take the bus unless they are too poor to own a car; American public transit use is the lowest among 'developed' nations. Besides, even Americans who are willing to wait for the bus aren't going to support transitioning to a system where the lights or stove may not come on each and every time a switch is hit or a dial turned. Apples and oranges. As a European, I think you may underestimate the disdain Americans have for transportation alternatives such as public transit and bicycling and how our infrastructure has been built-out over decades with the primary, often exclusive, goal of facilitating the movement of cars (with a few exceptions such as New York City). We really don't like waiting for the bus and just want to get in our cars and go. Even if you could convince Americans to be 'demand managed', people still won't want to be left in the cold and dark (at least not very often). So that implies a big rollout of storage and grid interconnectivity to deal with darkness and calm. So I remain unconvinced that we can substitute diffuse flows of renewable energies for the concentrated stocks of fossil fuels we have become accustomed to and still have a society not too different from the present one. Even if we could, I very much doubt we'd make the necessary investments until a crisis hits, at which point we'll probably lack the capital, resources (I did read Extracted), and energy to make any sort of transition. In the meantime I'm going to follow John Michael Greer's advice to collapse now and avoid the rush. "I'm still surprised you would dismiss the idea of PV having a low EROI as just a 'legend' since Howard T. Odum came to that conclusion over twenty years ago." Yes, TWENTY years ago, and based on even older data, and many assumptions which then turned out to be wrong. Some time ago, I did some back of the envelope calculation to determine how long it would take to replace all energy consumption (18TW) with PV assuming we could produce silicon at the same rate as steel (200Mt per year). The area to cover was roughly the size of France and even when using very thin silicon layers it would take around 100s of years if the Si production rate was constant. This was probably a pessimistic estimate since the Si production rate could be ramped up and having the EROI staying high enough should be enough to determine viability of a technology. 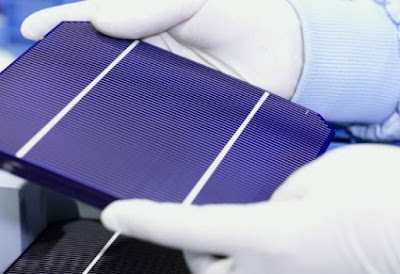 Still I'm wondering whether the ageing of solar cells won't prevent replacement in time. Would it be correct to say that one has to produce solar cells fast enough that the energy requirements would be met before ageing starts and replacement has to begin? 1st day tally so far is 60 responses. Very well educated demographic, Masters level and above mostly. Half from North America, a third from Europe, a tenth from Oceania, 2% from South America. 90% Male. Send the survey link to friends and relatives, so we are not just getting blog readers, an get a more diversified sample. The survey will be open for a couple of weeks before I publish early results. Ugo - I suggest you take this up with Charles Hall, Pedro Prieto, Ferroni/Hopkirk or Graham Palmer. A paper recently published in Energy Policy by Ferrucio Ferroni and Robert J. Hopkirk and titled Energy Return on Energy Invested (ERoEI) for photovoltaic solar systems in regions of moderate insolation. They used a similar methodology thart Charles Hall and Pedro Prieto used in their study for 4 GW in Spain. That is, they considered not only the usual energy inputs for modules and its components and/or some immediate accesories to them, but also some societal sine qua non energy input expenses for solar systems and concludes that in these regions (countries like Germany and Switzerland), the EROI is 0.85:1. Scientific studies show it takes years to payback the energy used in solar electric devices. EROI (Energy Returned on Energy Invested) says it takes energy – mining, drilling, refining, transporting, installing, maintenance, and replacement parts – to make the devices necessary to capture solar energy. Spain’s Photovoltaic Revolution: The Energy Return on Investment by Prieto, Pedro A., Hall, Charles 2013. Spain’s Photovoltaic Revolution presents the first complete energy analysis of a large-scale, real-world deployment of photovoltaic (PV) collection systems representing 3.5 GW of installed, grid-connected solar plants in Spain. Prieto and Hall conclude that the EROI of solar photovoltaic is only 2.45, very low despite Spain’s ideal sunny climate. Germany’s EROI is probably 20 to 33% less (1.6 to 2), due to less sunlight and efficient rooftop installations. This study does not detail the environmental destructive mining, toxic chemicals or air and water pollution necessary to get the materials for manufacturing and installing solar devices. It is the sun not the devices that is renewable, green and sustainable. know about these papers, of course. They are starting from certain assumptions and arrive to certain conclusions. Nothing wrong with that, and the assumptions are clearly stated. In this sense, they are legitimate studies. I also suggest looking at the videos from the industries. The real EREOI on photovoltaic energy is typically close to INFINITY. Why? The sunlight was going to waste, so it doesn't count on the denominator. The denominator is strictly the energy cost of manufacturing and installation. The panels last forever, so the numerator goes to infinity as time passes. This doesn't always apply but it actually does apply to many situations where solar panels are installed! 1. Mine the raw materials using equipment powered by solar panels. 2. Transport and convert metal ores, eg bauxite -> aluminium, using equipment run by solar panels and in a factory built using the energy from solar panels. 3. Make the finished panels in a factory run by solar panels, including building and maintaining the factory. 4. Transport, install and maintain the solar panels using equipment running on solar panels. All this is presently being done with the energy from fossil fuels. How will it be done when they are gone? Ugo, renewable energy is great but there is a problem. I reference the intro to last years film "The Survivalist". The film intro traces world population with time to start with using a dynamic red line on a black background. After this red population line has risen awhile a blue line joins the red to trace out oil consumption and the lines cross. We don't know where on the graph our present time happens because the blue peak is off the top of the screen. It later falls in the familiar bell shaped curve of the well known peak oil graph and again crosses population which has been continuing to continually rise. Population should drop after oil consumption begins to crash but it doesn't for a significant time after oil consumption has been greatly reduced. Later population does peak and when it does a Seneca cliff is clearly evident as die-off begins. This makes the tail of oil consumption drop all the way to zero. As the zero of population is also approached the rate of its fall begins to level out so that the die-off while still occurring is happening at a rather slow rate when the film begins. Lets consider population continuing to increase after oil consumption has fallen as evidence of the promise of renewable energy. Two authors have made my point before me. The point is that man innovates and gets technical to solve problems of shortage and having found technical solutions achieves increased efficiency because the technical fix is superior to what had been done previously. This increased efficiency can be thought of as profit but invariably the profit is consumed by increasing population until the technical fix can no longer provide at which point a new technical fix is needed. This can't go on forever and unless mankind makes new arrangements with reality we are all doomed. The problem it appears is that we are very smart but not smart enough. Fundamental changes are needed along with all the technical fixes we can find. On the question of why use electricty, rather than heat, as a mechanical engineer I can tell you it is because heat is a very poor energy vector (the ability to move energy from one place to another). Good energy vectors are electricity, petroleum, gas. Petroleum is particularly good as it has an inherent easy storage capability (A bucket of petrol is pretty easy). On the question of how much of our TPE is driven for "heat" the answer is about a fifth. See the paper by Cullen and Allwood (2010) doi:10.1016/j.enpol.2009.08.054 which tracked energy flows in the global system to final use. Note that their "thermal comfort" also included cooling, so soalr heating will not help there. As engineer, I did by my own some back envelope calculations. I took all the energy bills of my house, and plotted the consumption. >70% is some form of heat, not including fridge. Remaining is electricity, washing machine, fridge and light. Since Sun is specially good at heating, usually >70%, and specially bad at doing electricity, <15% for policristaline, including MPPT's, inverters, etc, I wonder which is the ERoEI for solar water heating. LCA for them would be also interesting. Since they can be done in the backyard with recycled materials, by hand, with low technology, I guess ERoEI would be better. So, why should we be stuck with electricity? Why not direct action renewables? Solar heated water is also easy to store. OTOH, since a big part of electricity is for illumination, I wonder how PV fits the fact that I mainly use light at nights, not during sun hours (my house is pretty sunny, here, in Spain). And, >60% of energy consumption at home are during january and february, winter time. It is heating, because winter is cold. And winter is cold because there is no solar energy to heat the country. In Spain seasonality is 4:1, in UK and Deustchland is closer to 6:1. In Norway is even worse. Year on year variation is also in the range 2:1 too. Since the biggest energy consumption is in winter just because there is no sun, I wonder how that fits your calculations, your intemitencies and ERoEI. In fact, energy consumption has a big big part of complementary use regarding the Sun shining. And about intermitencies, I wonder how can we handle electronics manufacturing, mining and smelting with intermitent energy, not to mention inestability and the issues involved with the 70 elements of the periodic table that has to be mined and highly refined before they are used in electronics manufacturing. But since I'm an electronic engineer, not a scientist, I tend to see electronics everywhere, inverters and MPPT's, chargers, IoT (for demand handling), the grid surveying and stability systems and such, so I can't understand how we can run our society without electronics. And I also tend to apply Liebig's law to this point. BTW, my biased point if view tells me that your materials list for PV is pretty short. Electricity flows without copper? No electronics to control PV output? No steel and concrete to hold the panels? No glasss (yes SiO, but Li is added to reduce the amount of energy used to generate glass, that nobody seems to account for)?, no aluminium? And what about those many many may uses of other forms of energy that if converted to electrical will have less efficiency, like producing glass? I still have to figure out if we mostly need heat, why should convert everything to electrical, why should we put all the eggs of energy into the same basket. Metering and the power to tax and pass the bill with full control over the one and only way to have energy, by reducing diversity? The survey is now at 77 Respondents in pre-Release. I will officially release the survey on the Diner on Sunday, along with the early demographics which are astounding, particularly in the formal education of the respondents. As of right now, 14% of respondents have a Doctoral degree, 29% Masters, 32% Bachelors. The population at large 3.2% doctoral, 11.8 Masters, 32% Bachelors. Definitely not a random sample. lol. You can look at this as positive or negative. Positive in that in theory you are getting mostly opinions of well educated people. Negative in that you're not getting a sample of what the general society thinks. Bigger sample size is always better! Send the survey link out to friends, relatives and coworkers. I received this comment from Pedro Prieto that didn't pass the Google screening because it was too long. I am posting here on his behalf in three parts. Here is the first part. Dear Ugo. Thanks for finding our work at least legitimate. A book does not need to be peer reviewed, but for your information, two well qualified persons, both professors in Spain (mentioned in the list of acknowledgements) that have reviewed scientific papers many times, did review the article and produced comments and corrections before it was published. Of course they were not within the group of people usually peer-reviewing the conventional EROI papers; otherwise would probably have not seen the light. So, in this sense, yes, the view is something thought out of the usual box. Now, what I would like is for the people to check if the energy input factors that we considered were wrong, or if they could be avoided or are not SINE QUA NON energy expenses, even they, of course, differ from the conventional EROI previous studies focusing basically in the module and a very small and immediate Balance of System (BoS). I will warmly welcome any comments or critics in this respect, if they are fundamented. As for the comparison of kiwis with watermelons, let me disagree. There are also studies of fossil fuels extended EROI. Of course, they give some results much lower than those EROIs just considering the cost of the power plant in itself. So that now you can easily compare watermelons with our watermelons. The number of previous studies on conventional EROI are to be taken with a pint of salt and with all respects. The so called existing "standards" were unable to produce coherent conclusions for more than a decade and many of the cross-fertilized citations and self-quotes of the authors that kept an endogamic procedure of peer-reviewing for a long time, even surprisingly disagree among them in the results, sometimes in up to one order of magnitude. This, despite that since one decade, the progress of the sun-to-power conversion efficiency in the PV modules has merely gone from 13 to 15% in average. Just for the sake of comparison, if we pick the latest Sankey Diagram of the International Energy Agency (IEA), if we take in one side the 13,137 MToe/year (or 17 TW of equiv. power) of primary energy and what the IEA calls "own use" (self consumption), which is 784 MToe/year, we get a rough global energy EROI of about 16:1. Should we use it the final energy values after losses (8,917 MToe/year), then we get roughly a 10:1 EROI and this is extended. If we consider that in the final uses there must be a number of human activities also related to the energy uses, which are not included in the "own use" consideration of the IEA (i.e. allow me the joke, the energy spent by Fatih Birol in his trips as main responsible of this entity) and many others, we may well be having a global EROIext of one digit. And just to be straightforward, despite the EROI must have difficulties in being ascertained with accuracy, it is no doubt a good tool to "feel" if we are having an energy problem. It is precisely the inevitable erosion and degradation of the EROIext of the fossil fuels combined, what has probably to do a lot with the permanent global crisis we are facing since 2008. Being the minimum EROIext for any live being (mammals in particular) 2-3:1 in average, to be kept alive as species and for the couple to successfully breed their offspring (minimum of 2-3 per couple), probably Charles Hall is very right to state that a minimum EROI of 5:1 is required to have a minimum (very primitive and elemental) of civilization, beyond us living as naked apes. Sumerians were the first ones in being able to release kings, priests and military from productive works with the net energy surplus left once we pass to the Neolithic, domesticated animals and plants and stored them in the form of available energy surplus. So, an immediate and interesting rough and sensible conclusion is that any energy system unable to deliver less than and EROIext of 5:1 will not sustain this demanding and consumerist society. When we did the study, we thought that fossil fuels, WHATEVER the EROI had (be that the conventional EROI or the EROIext) do not need to prove that they had been able to deliver enough energy to undertake the exploration, drilling, extraction, transportation, creation of the fossil fuel given infrastructure, more transportation, refining and even more transportation and distribution of it to the global society, leaving BESIDE enough NET energy to erect and keep in motion the ever growing global industrial and technological society we know since we both were born. I hope nobody doubts that fossil fuels combined, until now, had, whatever it was, an EROIext breeding themselves and allowing human kind to create what we can observe today. That is, an EROIext that suffices to feed our ever growing world at levels never seen before, at least in the last 150 years. That is why it is of essence to check and double check, again and again, if modern renewables are going to be able to replace IN FULL to fossils in volume and time, while they fade in volume and in net EROI, or as we try to get rid of them to avoid more Global Warming. Or if we finally have to think in another way outs, as orderly as possible, with less energy per capita and less global energy (power down or decroissance). Because if we are right, with an EROIext so close to 1:1 it is counterproductive to invite to massive investments in solar PV energy, because we will be accelerating the exhaustion of the remaining fossil fuels. So, for us, what it was important, in knowing that modern renewables are ABSOLUTELY underpinned today in our fossil fueled society, was to determine if they will be able to breed themselves completely and BESIDES to keep our present +13 billion Toe/year (with more than 87% of it non renewable) society fully powered. In order to check this, I think we have a moral obligation to look beyond the minimized conventional EROI studies to date and go to real life EROIext, with all the complex interconnections and the energy input extended boundaries, which are SINE QUA NON to have the renewable plants up and running. The existing (conventional) EROI standards, fixed by the PSPV working group of the IEA are not necessarily a sacred and untouched instrument . If they are wrong in some assumptions or shortsighted for some applications in globally analyzing our prospects for the future at global level, then we have to review them. In this sense, we have also the obligation to think if these standards are not the ones really "cherry picking" the results, rather than studies looking beyond the module and an almost negligible BoS energy inputs for all the involved SINE QUA NON energy input expenses for solar systems to be up and running. One of the comments here said our study "was not fair" because we had included things as "Electrical Network/Power lines restructuring","Security and Surveillance", "Network Stabilization Associated Costs (Combined Cycles) -and I will add many other societal energy input expenses-. This has a very simple answer, if the above considerations are taken into account. Or does the people thing that the solar PV technology may replace the fossil fuels activities society without a national -or global- electrical grid? We put a very conservative cost of this. If solar was 3% of the total penetration in energy demand and the contrasted and public O&M costs of the national network were X, we just incorporated 3%*X of that O&M. Or does the people think that when solar will reach, for instance, 50% of our total primary energy demand (if ever), the electrical grids will be constructed out of thin air and have no energy expenses (costs) to be considered and included, or that solar will have not have to be liable for 50% of these O&M costs of the resulting global supergrid? "Security and Surveillance". Does people thing or believe that plants do not spend energy in these aspects? If they spend it, why excluding it from the real life EROI ext? "Network Stabilization Associated Costs (Combined Cycles). The same here. Our book makes a very clear analysis of the public admitted losses by the power utilities with the CCG plants, for having been forced to back up modern renewables, because the law gives priority to the renewables to enter in the grid when there is sun or wind. They were designed to work and operate 5,500 hour per year with very few controlled interruptions. As they have been forced to backup they are operating today at less than 2,000 hours/year and with continuous pre-warming and post-heating processes with short hours notice, to cover the gaps when the wind does not blow or the sun does not shine and there is demand. These forcings are degrading the CCG plants life times much faster than expected and the much lower incomes are taking them to bankruptcy, so that the government (we only took official figures in Spain and made a very conservative split for wind and solar) had to finally subsidize the CCG plants. What are we supposed to do, to ignore and forget these REAL LIFE energy input costs as most other conventional EROI studies have made? "What are we supposed to do, to ignore and forget these REAL LIFE energy input costs as most other conventional EROI studies have made?" Why? Because you are not calculating EROEI of PV. You are calculating something like "Total EROEI of a Spanish PV into a fossil fuel society, in a electric net with a gas bubble..."
So, what's the matter here? It's supposed that we want to calculate EROEI to see if it can move a society. Assuming the correctness of your document, and way of see EROEI, the conclusion of this is that the pure PV part is not the problem , but the costs linked to PV into the actual architecture of how the society works. As Ugo said before, we could use "demand management" for example. So, from your perspective of calculation, by using "demand management" we automatically raise the EROEI of PV. Even more clear when it's because simple temporal states like using plants not designed to the actual configuration. Is it not obvious that this is only a temporal problem that lowered the numbers artificially? If the purpose of EROEI study is to optimize the gain of energy, then this is usefull, but not to say that PV is not enough, but to say "we need to change other things to allow total EROEI to be enough high". But if the purpose of EROEI is to see that PV cannot work or move a advanced society, the study can not include this that are not PV related and we haven't study in depth to see which things need to be optimized, changed or removed. Another comment by Pedro Prieto that he had some problems in publishings because it was too long. I am publishing it in two parts. Here is the first. If we have a Combined Cycle Gas power plant (CCG) that uses the electric network to provide, let's say a 20'% of total national demand, as NET energy in the point of use to the society, the real life EROIext should consider the proportional part (20%) of the energy investment costs to have this network up and running and being operated and maintained. Otherwise, the CCG plant will never give a single kWh to the society. For the same token, if one day solar PV reaches, let's say 20% of the total national electric demand through this national electric grid, it is of common sense that we should attribute the 20% of any energy invested costs to the solar plants using that network, that otherwise will not reach hospitals, malls, schools or whatever. Unless we invent something to either to transport electric energy in wireless form or that you get Singapore, Shanghai, Sao Paulo or equivalent cities absolutely self-sufficient with individual scattered installations in the roofs, including the energy to produce the energy carriers to power the aviation in airports, ships in ports and so on. So, this is, either we like it or not, the EROI of solar PV, as it should be the EROI of a CCG plant before. Otherwise, keeping this blind spot is a recipe for the disaster in calculating the consequences and collaterals. That's the matter here. The problem is in everything, not only in the pure PV part is a problem, but every type of energy invested around that is indispensable for the PV modules to be manufactured, installed and operate. As for the “demand management” to supply a global society in all the current activities that are undertaken and given for granted today, well, I would like first to see how this works in a single country and then we could talk. Meanwhile, with all respects to Ugo and you, talking about demand management as a solution of the dire energy problem of our complex and demanding society is pure wishful thinking. In Spain it is in force, since many years, the so called interruptibility service, a form of contracting the electric supply as an invitation mainly to important consumers. It offers discounted electricity prices, with the condition that they may be interrupted on request of the power utility when required. It is a demand-side management tool. But has not worked well and of course, is absolutely negligible with respect to the total. Just google the media on the problems arising from this offer to the few that used it and will realize how difficult is to move one single feet ahead in this marathonian race. So first go and test yourself with the real world and then we can discuss further. Finally, the purpose of any EROI study, in my opinion, is not to optimize what today is a disaster from the net energy delivered to society so that we can force the technology machine to “get it right” (this, in any case, would be the task of science and technology, if possible). The EROI, in my opinion is rather to really check how much real life NET energy is really reaching the society from a given and EXISTING energy source/system (not THEORETICAL or FUTURE energy source/system, because everything holds up in a paper) . And then, in any case, to see if that NET energy amount suffices to keep a given model of societal consumption to keep operative with just this type of supply, while it lasts. For instance, if the final result is 3:1, this energy source/system will yield the same level of NET energy than the metabolism of an average couple of mammals to feed their offspring and therefore survive as species. But not to keep an advanced industrial and technological society which is a prerequisite to build solar PV modules and its associated parts and electric appliances to consume the produced electricity. So, in this case, there is a contradictio in terminis, as hunter gatherer societies (the only ones able to live in a stable form with an EROI of 3:1) were not known for building up complex clean pressurized chambers with their micrometer air filters to get four to six nines of silicon grade purity, or sophisticated machines to cut in fractions of millimeters the ingots to produce the wafers, robotic soldering machines with micrometric precision to make the silver connections between cells, or electronic factories to produce the solid state power devices like the IGBT's and many others for the inverters. Well, I am afraid it is time to take the EROIext methodology into consideration, because fossil fuels are also in their way down and every day less and less NET energy is going to arrive to our global society. It is time not only to view solar or wind as a partial or particular solution to replace electricity from fossil or nuclear sources. By the way, no one single renewable TWh has replaced a single TWh from fossil fuel origin, but adding it to our ever growing consumerist basket, making good the name that Gail Tverberg gave to the modern renewables as "fossil fuel extenders"). What is at stake is not only solving "my home" electrical demand with renewables"; or my electric plug-in car; it is something much more serious: it is the depleting fossil fuels flows (and hence EROIs) and how we are going to handle this at global level. We need to address the whole primary energy consumption, today mainly fossil and in full retreat. And in doing that we need to understand two basic things: one is that many of the present and INDISPENSABLE human activities are not easily replaceable by electricity and using energy carriers from electricity of renewable origin will be a complete disaster in terms of final real life EROI. The second is that we need to understand all the complex energy inter-relations in our industrial and technological society and to this effect, we need to forget about conventional EROIs looking themselves to isolated systems or examples, but extended EROIs analyzing all the possible interconnections and bottlenecks. It is not about solving our Western individual style of our private bungalow by installing a rooftop solar system, but solving the problem of feeding huge apartment blocks in megacities where more than half of the human population lives today, powering subways, express lifts in the Abu Dhabi , New York, Tokyo or Shanghai skyscrapers, heavy transport by road much beyond the dreams of private electric cars and including rural road transport), it is the mechanized agriculture, powering hospitals, jails, schools, streets, universities, ports, airports, ministries, police stations, supermarkets, all in 24*365 mode. It is about powering the merchant fleet, the fishing fleet (should a fish still remain alive in 50 years), the civil aviation with more than 6,500 planes continuously in the air, the armies (that would joke if they are asked to power their toys with electricity) and a big number of etceteras. >Two highly qualified Google engineers who have spent years studying and trying to improve renewable energy technology have stated quite bluntly that renewables will never permit the human race to cut CO2 emissions to the levels demanded by climate activists. Whatever the future holds, it is not a renewables-powered civilisation: such a thing is impossible. I got the distinct feeling they can't imagine a world run with intermittent energy and using renewables more locally, but I'm no expert. I saw it. It appeared two years ago and now, for some reason, it is making again the rounds on Facebook. It looks like a very slick piece of propaganda for the nuclear industry. Suffice to note the headline of the second part "Revealed: The disruptive new energy technology that could save the human race" And they refer to nuclear fission. I could rewrite that as "Revealed: The disruptive new energy technology that could save the human race - and it is photovoltaics!" Therefore, your answer looks like a very slick piece of propaganda for the PV industry. Ouch..... I have been discovered! (ii) valid for an insolation level of 1,000 kWh/(m2*yr). When the output is converted to primary energy equivalent, based on the UK grid mix efficiency (35%), the resulting EROI_PE-eq is ~10 (as shown in Figure 4 of the same paper). And then, if the same PV systems were deployed in Spain, where the insolation is closer to 1,800 kWh/(m2*yr) , the value would be ~18. Bottom line: before quoting any number out of context, one should read the whole paper and understand the specific conditions to which it applies and the underlying calculation details! Since hydrocarbon fuels entered the mainstream of our lives, the energy that has fuelled our lifestyle has been almost 'incidental'. In other words, we have had as much as we wanted, whenever we wanted it. At 100:1 return on EROEI, it was effectively free. Cutting through all the various "energy production/delivery systems" being proposed, (solar panels being just one of them) it would seem that we are reaching the stage now where our prime function is the production of energy as an end in itself. To this end we find ourselves scrabbling around trying to maintain that old "cheap energy" system, using energy that is expensive to get hold of. Not only that, as'cheap oil' disappears altogether, it is going to get more and more expensive as time goes on, because all "alternative energy" systems require a hydrocarbon infrastructure in order to function. Projecting this hypothesis into the future, we must inevitably reach a point where our entire industrial output is dedicated to the production of sufficient energy to maintain---wait for it---our entire industrial output. Utter nonsense of course---but it's as well to see where we're headed. That sounds about right to me although I have no expertise or experience worth mentioning. There has been world economic growth since 2008, but although there is probably in the next few years some further industrial growth possible (needed for GDP, it is hard to imagine there is that much more left in the system. Can we imagine China doubling its economy yet again in the next 10 or 20 years? China has increased its total energy use by a staggering amount in the last 15 years. They are just too big now to do anything like that again. To a perhaps lesser extent the same seems to apply to India. Europe minus FSU has seen a significant decline in energy use since the peak in 2007. So has Japan. The USA, N America as a whole and Australia have also peaked and declined but not by nearly so much. The Russian Federation might have peaked more recently. Brazil, having grown fast like China and India might be peaking about now. I have just now used the site’s ‘all fuels’ facility to explore trends in total energy use. If "growth" is defined as total GDP/total debt, the world is definitely NOT growing. May very well be as you say, Nate. But it looks to me like the reason for installing as much renewable power as we can, until we can. Many thanks to Pedro Prieto for his recent extensive and illuminating comments on EROI here and on several other energy blogs. I don't think we can overestimate the importance of this type of analysis in guiding society towards energy sources that have a hope of replacing fossil fuels. PV solar doesn't appear to be a contender. i think ugo you are falling for cornucopeanist fantasies in trying to suggest PV can run our civilization. without degrowth of staggering magnitude over the next decades, there is little point in trying to kid ourselves industrial civilization can run on PV. its a moot point, in other words. even if PV could be built up enough to run our dementedly massive cancerous civilization, without end to growth there would need to be constantly increasing amounts of the earths surface devoted to solar power. so same old problem. but if we had a degrowth policy (to allow PV to run it all), how would we keep the industrial machine fired up to create the PVs. its all a bit of a catch 22 if you ask me. "sufficient to power 5000 homes" or whatever. Powering homes is the least of our problems. The power consumption of the average home is only about 10% of the total power needed to support the infrastructure on which the "home" depends. Any calculation of the EROEI of PV technology has to include the energy (from fossil fuels, mostly) that goes into the following: mining, refining, sales/marketing, manufacturing, shipping, installation, tech support, research, lobbying, publicity campaigns, education/training, zoning/licensing, dismantling and safe disposal. I probably missed a few. Also keep in mind that the energy cost of one person doing absolutely nothing is around 1500kCal/day. And the energy cost of one person digging up 1 kg of potatoes (worth 1500kCal) is about 10 minutes of work with a pitchfork, so maybe 25kCal. EROEI = 60:1, with no environmental damage. Now that's what I call efficient! EROEI means nothing without real (pure/direct) democracy or equality anyway. It's not really a technical problem but an ethical/social one. We had something of this discussion on Peak Oil Barrel a few days ago when Euan Mearns broke a story about a new study regarding the EROEI of solar. Dmitry's potato thing can turn into potato-fueled-slaves slavery and we have built-in wage-slavery and debt-slavery today anyway. Slavery never went away, it just changed clothes. Big Government owns most of Big Oil, which is getting into Big (Pseudo)Renewables, which has to mean somethings, including maybe Big Bubbles (like solar?). More clothes changes. Industry (solar, wind, etc.) exists within certain sociogeopolitical 'Crony-capitalist plutarchy' contexts. Ostensibly, that's in part how collapse happens. That said, solar EROEI isn't going to save us regardless of what it is if we can't save ourselves first. Below is a comment on your piece by Saral Sarkar. I do not know if you have provided answers in the above correspondence because I have not read them. But, if not, we would be interested. I just read Ugo Bardi's article with interest. I am not a scientist, never tried myself to measure the EROEI or the EPBT of any energy technology. But I am very interested in the question, for obvious reasons. I am trying to keep abreast of the news on this matter. But I am not convinced that the EROEI of photovoltaic technology is that high. (1) The proof of the pudding is in the eating. If the assertion of Bardi were true, then there would not be any reason at all for India, much richer in sunshine than Italy, to still build new (I stress new) coal-fired power plants and to import huge quantities of coal and oil and pay high amounts of precious foreign exchange to foreigners. If the matter were that simple, the problem of global warming would have been solved long ago. The first author of the paper Bardi refers to appears to be an Indian (or of Indian origin). Why doesn't he go to New Delhi and persuade the Indian government to cover all desert and semi-arid areas of the country with photovoltaic panels? After all, only a few months ago, at COP21, India was heavily criticized for obstructing the process of reaching a global agreement. (2) I think most studies that paint a rosy picture in this question tend not to count all (I stress all ) energy costs (investments) needed in building a solar module. That is why, already in 1991, some researchers who, commissioned by the EU, made a study in Europe came to the conclusions (a) that in European climates, the average EPBT for photovoltaic modules were as low as 1.2 years and 2.1 (meaning EROEI was very high) and (b) that the EPBTs of the PV-technologies developed till then were by and large "comparable to that of large-scale electricity production in fossil and nuclear power plants".1 We know that PV technologies, in spite of all subsidies and sundry favors, still cannot compete with fossil fuel based technologies of producing electricity. I would very much like to read Mr. Bardi's response to this comment. Dear Johnny, if you allow me, this is exactly the point I am trying to make. Or, better said, the two points I am trying to make. The first is that when one measures something, one should be rigorous. The second is that one should know what one is measuring. So, the qualitative mixing up unrelated elements doesn't help anyone. What does it mean to say "if PV has a a high EROI why does India still build coal plants?" Think about that: does it mean anything? Think more about that: doesn't it prove that we should all be more rigorous? Dear Ugo, in real life it is very useful/necessary to take a round-about (indirect) way to reach a goal when there is no direct way to reach it. It is even scientific. James Lovelock (of the Gaia hypothesis) did that when he (plus many other scientists) was asked by NASA to figure out whether there could be life on the Mars. He could not land on the Mars to find out the answer. So he asked, how would the atmosphere of Mars be if there were life on that planet. We are today faced with a vital real-life question: Can someday in near future fossil fuels be replaced by photovoltaic energy etc.? We cannot answer the question directly by "rigorously" counting the calories of energy invested in manufacturing all the equipment of PV technology because it is nearly impossible. That is why every researcher is guessing. Guesstimates are anything but rigorous. That is why so many different results are on the table. Nobody, for example, really knows what proportion of the energy costs of manufacturing the truck that is transporting the sand to the silicon smelter should be included in the energy costs of manufacturing a PV module. I do not want to write more on this point. Georgescu-Roegen (1978) put it more clearly. I hope you'll excuse me, Saral, if I tell you that you are exactly making my point: that is that we should NOT mix up different things. One thing is the measurement of the energy return of a technology another is its ability to replace fossil fuels. A rigorous measurement of the first point is a necessary input for discussing the second. If you go in reverse, that is you start from the second point; then you won't get anywhere - you are doing politics, not science. An energy miracle? But we already have it!